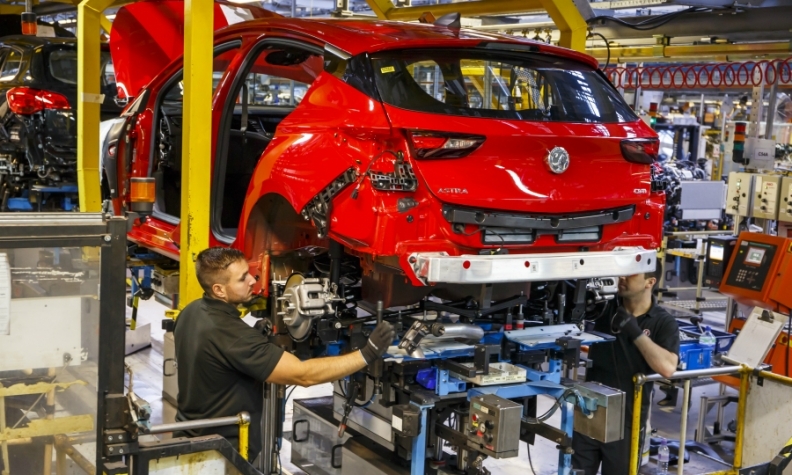 Vauxhall builds the Astra compact in Ellesmere Port, England. GENEVA -- PSA Group has joined Ford Motor and Jaguar Land Rover in calling on the UK government to clear up uncertainty around Brexit, before the French automaker can make decisions over the future of its Vauxhall plant in Ellesmere Port, northern England. Ford said on Tuesday it was seeking clarity to help it make decisions on future UK investment, while on the same day JLR said it required details on plans to exit the European Union before building electric vehicles in the UK. PSA bought Opel and its British sister brand Vauxhall last year when it acquired General Motors' loss-making European arm and has been pursuing a restructuring plan to return it to profitability. The French automaker is cutting the workforce at Ellesmere Port, which builds the Astra model, by a third to make it more efficient, but the move has renewed workers fears about the future, with the company yet to decide about future production at the site. Unions want the firm to commit to fresh investment this year but PSA said Brexit uncertainty is weighing on its decision-making. "We can't make the world any easier for our workers and unions and staff than it is for us on the outside," PSA Europe boss Maxime Picat told Reuters at the Geneva auto show. "When there's uncertainty, we cannot bring them certainty. We're going to have to wait for the political calendar," Picat said.